Got more questions that are not answered here? Just bark at us through the contact form. Dog Tag Art tags are made from an ultra-strong recycled steel core about 1mm thick. The steel is coated with an everlasting special polymer which allows us to infuse graphics and text using a special process. The final result is a pleasure to hold with smooth rounded edges and a porcelain look and feel. They are manufactured and made in the U.S.
How big are the tags? 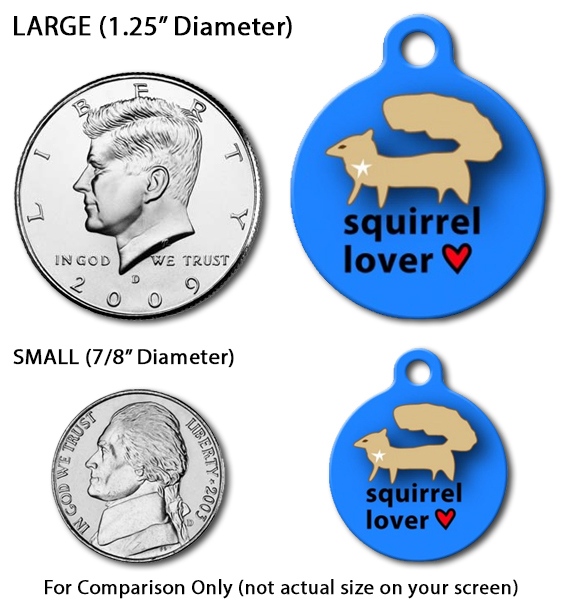 Our large tags are 1 1/4 inches (3.18 cm) in diameter, which is about the size of a U.S. Half Dollar coin. The small tags are 7/8 inches (2.2 cm), which is about the size of a U.S. Nickel coin. Both are about 1mm thick. Each tag comes with a sturdy steel split keyring for attachment. What’s the difference between "Classic White" and "Silver Plated" tags? Classic White Tag Finish is the Original Dog Tag Art tag product finish. Coated in a white non-reflective polymer coat that looks and feels like porcelain. Silver Plated Tag Finish is our newest tag product! Plated in Sterling Silver and finished with a glossy polymer coat. The resulting product is a highly reflective pet ID Tag with a premium look and feel. Is my custom text printed over the design shown? No. Your custom text is printed on the back of the tag in black text on a white background. The design that you choose is printed on the front exactly as it is shown on the website. We guarantee the tag text will never become unreadable. If, for some crazy reason it does, we'll replace it for free. What type of shipping do you use? How much does it cost? For most orders we use USPS First Class. It costs $3.98 for all U.S. orders and $4.98 for international orders. If you are ordering a collar add $7 to U.S. and $12 to Canada. Collars ship separately directly from the manufacturer. How long does it take to receive my tag in the mail? We usually ship within 24 hours from the time you place your order unless we have had a large influx of orders over a short period of time. You should receive a shipment notification email when your order has been dispatched. The order then ships from Asheville, North Carolina by USPS. The delivery time depends on your location but generally ranges from 3 - 5 business days. International orders can take longer (10 - 15 business days) due to customs and distance. 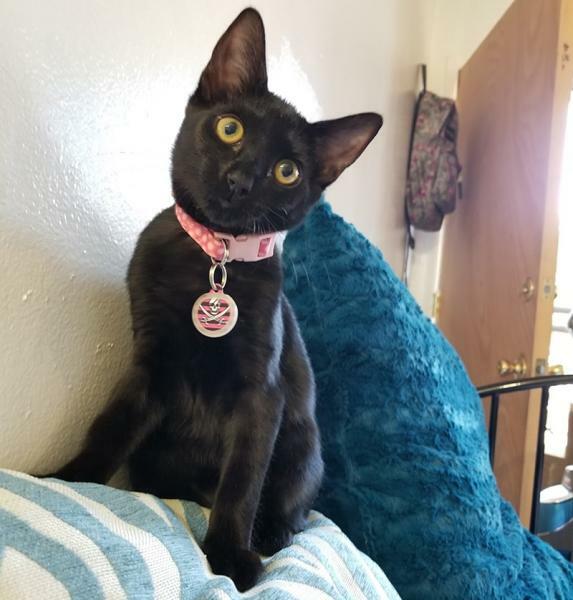 Are the tags good for cats too? Absolutely! Check out Wendy wearing one. What are some other uses for the tags? Our tags can be used in a variety of ways. They are a great way to add style and safety to all of your pets including, of course, dogs and cats. We've even seen them being sported by horses! Our customers have also used them as fun key rings and a unique way to ID luggage or school backpacks. We even wear them as fashion accessories like bracelets and necklaces. Be creative and they can be used in dozens of ways. If for any reason you are not happy with your tag, you may return it to us for a full refund. How do I contact Dog Tag Art? How can I become a Dog Tag Art artist? If you know (or want to learn) what 'layers' are, have ever been called "creative" and would love to enhance your pet's sass and style, we welcome your pet tag designs. If your design is fabulous enough to be featured on DogTagArt.com, we'll pay you a $1 royalty for each of your tags sold. Simple. It may not make you rich, but it adds up! We want to share the bones so to speak and reward your creativity. You'll also get a featured profile on the site and a link back to your site or portfolio. To get started with your design, be sure to create a profile with a brief bio and add a photo of yourself, your pet, or your artwork and then go to this submit Dog Tag Art page. How much and when do I get paid for my Dog Tag Art sales? Every time a tag you have designed and we have approved and published on the website sells you get $1. At the begininning of every month we review your tag sales. If there are over 20, we send the money via PayPal to the email address we have listed in your account. If there are under 20 then we just roll your tag sales over to the next month. How long does it take to get my submitted art published? * Sellability: Will anyone buy it? * Design quality: Is it clean or does it have jagged edges? is it the right size? * Uniqueness: Do we already have similar designs on the site? We also like to "space out" our publishing schedule to keep the first page of the catalog fresh and interesting. If it has been more than two weeks and you want some feedback you can contact us about your submission. Do you email me if my artwork is published? Yes. You will receive an email any time that a design you have submitted is chosen for publication on the Dog Tag Art website. Do you help with marketing my artwork? How can I increase my sales? Our Marketing Team actively promotes Dog Tag Art to generate sales through internet marketing, social media marketing and press releases. There are also several ways for you to increase royalties and generate income faster by contacting your personal network of friends and acquaintances. Tell your friends about your designs and help spread the word about Dog Tag Art by posting your work to Facebook and commenting about it, Tweeting it, or just telling your friends the old fashioned way... with your voice.